Theologians, social scientists and other scholars provide a stocktaking of public theology at the beginning of the 21st century. The contributions combine retrospect and prospect, seeking to discern continuities and changes. 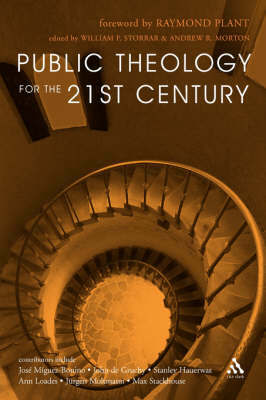 Theologians, social scientists and other scholars provide a stocktaking of issues facing public theology at the beginning of the 21st century. The contributions combine retrospect and prospect, reflecting on the issues and approaches that have characterised public theology in the 20th century, especially its latter half, and attempt to anticipate those which will or should come to the fore in the 21st century, seeking to discern continuities and changes. William Storrar is Professor of Christian Ethics and Practical Theology, and Director of the Centre for Theology and Public Issues, in the University of Edinburgh. Dr Andrew R. Morton is Honorary Fellow of the Faculty of Divinity of the University of Edinburgh.